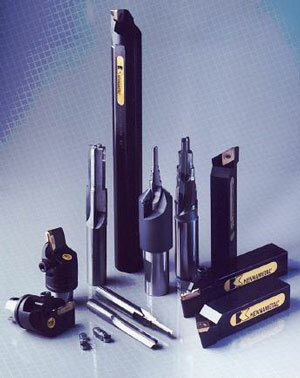 Kennametal, Inc.f tools was designed to allow turning and drilling of aluminum wheel from start to finish. The turning system includes high-positive-rake toolholders and boring bars, quick-change tooling, and coated and uncoated carbide and polycrystalline diamond inserts in a variety of chip-control and double V-bottom geometries. Products for drilling valve stem and lug holes include fine-grain solid carbide drills, PCD-tipped drills, and inserted combination tools that can drill, chamfer and perform other operations in a single pass.